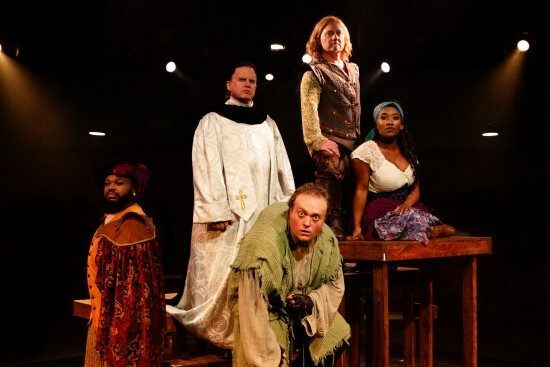 ‘The Hunchback of Notre Dame’ at Toby’s Dinner Theatre. 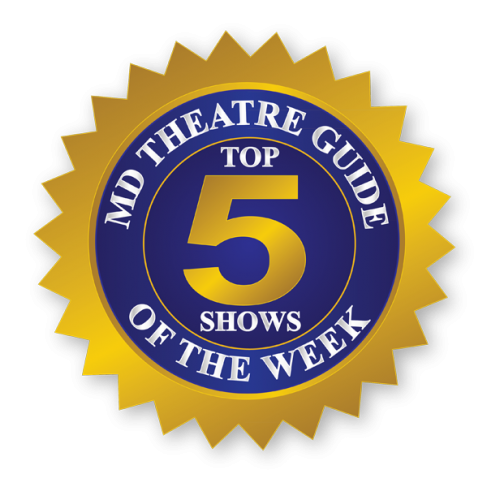 “This version of The Hunchback of Notre Dame should not be missed, and Toby’s stage is one of the best places to catch it.” – Susan Brall. Synopsis: From the Academy Award-winning team of Alan Menken (Beauty and the Beast) and Stephen Schwartz comes a stunning retelling of Victor Hugo’s epic story of love, acceptance and what it means to be a hero. As the bells of Notre Dame sound through the famed cathedral in fifteenth-century Paris, Quasimodo, the deformed bell-ringer, longs to be “Out There,” celebrating the “Feast of Fools.” A sweeping score with songs from the Disney animated feature and powerful story make The Hunchback of Notre Dame an instant classic. You will be swept away by the magic of this truly unforgettable musical. 2. ‘A New Brain’ at The Colonial Players of Annapolis. “A difficult show to perform, ‘A New Brain’ has hit the nail on the head with the phenomenal talent and a dazzling design. – Andrew Parr. 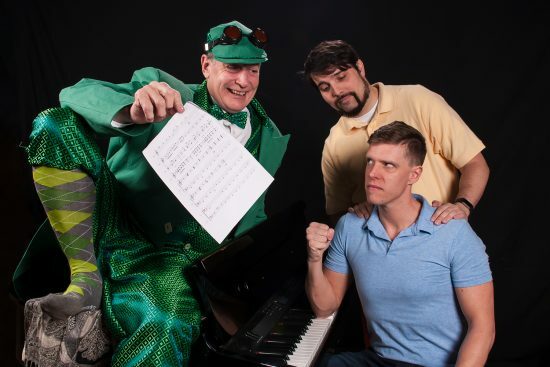 Synopsis: A New Brain is an autobiographical musical by William Finn, of Falsettos and Spelling Bee fame, concerning his bout with an arteriovenous malformation in his brain and the healing power of art through the character of songwriter Gordon Schwinn. Gordon is working at his piano to meet a deadline, irritated because he must write a song about spring for a children’s television host, Mr. Bungee, who dresses as a frog. Later, at lunch with best friend and agent, Rhoda, Gordon collapses face first into his meal and is taken to the hospital. Gordon’s greatest fear is dying with his best songs still unwritten. Descending upon his hospital room are a hilariously absurd cast of characters: his oppressive mother, his supportive lover, hospital staff, a wise homeless woman, and a hallucination of his haranguing, amphibian boss. Facing his own mortality and awaiting brain surgery, Gordon wrestles with the person he has been, the legacy he will leave behind, and ultimately, the person he will be if he survives. Mr. Bungee (Tom Newbrough) taunts Gordon Schwinn (Ron Giddings) with boyfriend Roger Delli-Bovi (Shane Conrad). 3. 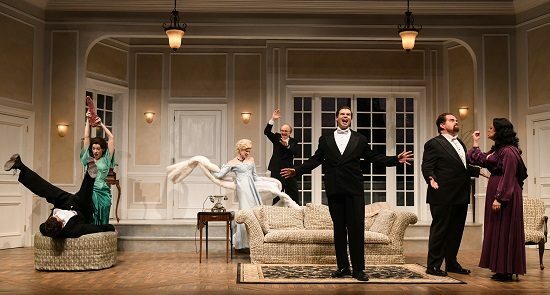 ‘Grand Hotel’ at Signature Theatre. “‘Grand Hotel’ is a visual and aural pleasure—sumptuously staged and beautifully acted, sung and danced.” – Mary Ann Johnson. Synopsis: It is 1928 and Berlin is at the center of a razzle-dazzle world between two wars. At the bustling Grand Hotel a series of eclectic guests and staff including a fading ballerina, a destitute baron, a wannabe-starlet typist, and an ailing bookkeeper collide in a non-stop musical toast to the high life. 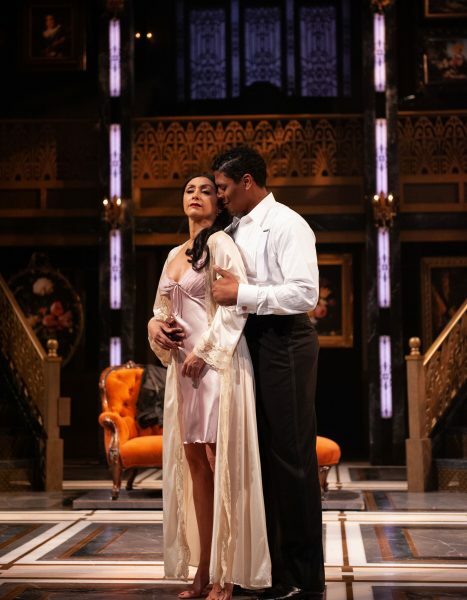 Natascia Diaz (Elizaveta Grushinskaya) and Nkrumah Gatling (Baron Felix von Gaigern) in Grand Hotel at Signature Theatre. Photo by Margot Schulman. 4. ‘P.Y.G. or the Mis-Edumacation of Dorian Belle’ at Studio Theatre. “‘P.Y.G. or the Mis-Edumacation of Dorian Belle’ is engaging, fun, and thought-provoking.” –Elle Marie Sullivan. Synopsis: Dorian Belle is a big deal. He’s a Canadian pop sweetheart, and he’s ready to be taken seriously. So his people hire his favorite hip-hop artists—Black and Alexand, the ‘bad boy’ rappers of Petty Young Goons—to help him toughen up his image. They’re black, he’s white. They’re from Chicago, he’s from Canada. It’s all on reality TV. What could go wrong? 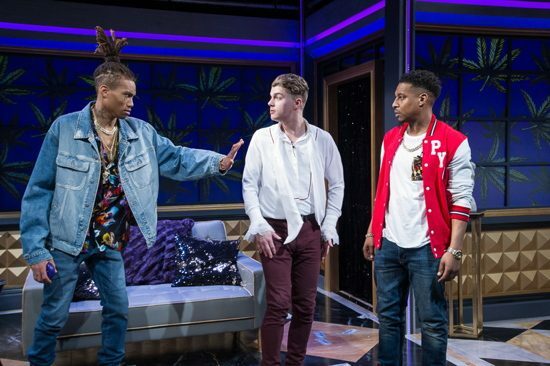 Inspired by Shaw’s Pygmalion, this world premiere is a blistering and entertaining look at cultural and racial appropriation in a fictionalized exchange of ideologies, vernacular, and alleged street cred. Seth Hill, Simon Kiser, and Gary L. Perkins III in ‘P.Y.G. or The Mis-Edumacation of Dorian Belle.’ Photo: C. Stanley Photography. 5. ‘A Comedy of Tenors’ at Olney Theatre Center. “...mind-boggling and fun to watch.” – Carolyn Kelemen. Synopsis: The Olivier Award®-winning playwright of Lend Me a Tenor is back with another farce set on the precipice of a big concert in 1936 Paris. When star tenor Tito Merelli refuses to perform at a Three Tenors-style concert, American impresario Saunders and his sidekick Max stumble-upon Beppo the Bellman, who happens to look exactly like Tito and has a voice to match. Throw in a couple of young lovers caught in flagrante delicto, Tito’s fiery wife, a randy Russian diva, some slamming doors, and the result is an uproarious laugh-riot and evening of adult fun. April Forrer has been a Maryland resident for over 15 years, having moved from Washington, DC after graduate school at the George Washington University. She began her writing career on Capitol Hill as a speech and legislation writer for two U.S. Representatives. She then started working with non-profits to enhance their media and development outreach. She now spends her professional time writing her first novel and designing and constructing costumes for theatrical productions. She savors her time spent with her three children, her dog and her husband.